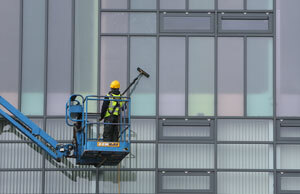 Our work involves providing you with reliable, cost-effective and safe, commercial window cleaning. Hospital sites, complex retail buildings and large residential homes are among the projects we regularly undertake. The end result is always sparkling, smear-free windows. The method for accomplishing that is tailored to your building and your requirements. There is no single right answer when it comes to commercial window cleaning. Your organisation is unique, as are your premises. We work with you to find the cleaning method that will result in you getting the safest service, the cleanest windows and the best price. We also clean gutters and carpets, and we can give any outdoor surface a new lease of life with our high pressure power washing. You can find out more by viewing our other cleaning services or call us on 028 7130 8521.